"Make this because it tastes awesome. What the hot oven does to the deep red San Marzano tomatoes is a wonder to behold, and produces a pasta sauce with some serious depth of flavor. 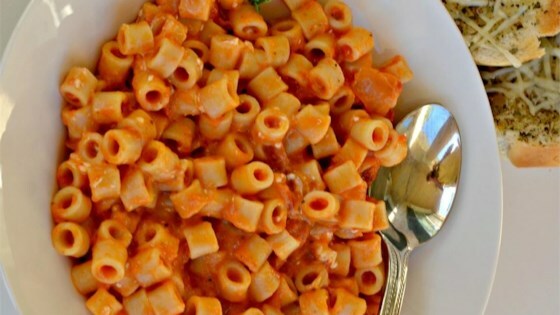 The always entertaining ditalini are a perfect medium for the rich sauce, smoky oregano, and creamy goat cheese." Drizzle olive oil over the bottom of a 9x13-inch casserole dish. Pour tomatoes and their juices into the dish; cut each tomato into 3 pieces. Sprinkle in onion, garlic, red pepper flakes, and 2 teaspoons oregano; stir to combine. Roast in the preheated oven for 1 hour. Remove dish from oven, stir briefly, return to oven and roast for an additional 15 minutes. Transfer roasted tomato mixture to a saucepan; pour in water. Process mixture with an immersion blender or potato masher until desired sauce consistency is reached. Stir in 1 teaspoon oregano. Season with salt and black pepper to taste. Set aside. Fill a large pot with lightly salted water and bring to a rolling boil over high heat. Once the water is boiling, stir in the ditalini and return to a boil. Cook the pasta uncovered, stirring occasionally, until the pasta has cooked through but is still firm to the bite, 8 to 10 minutes. Drain well and return to pot. Pour tomato sauce over ditalini; stir to combine. Stir in goat cheese. Wouldn't make again. Way too spicy (red pepper flakes?). I suggest simmering sauce after adding cold water while waiting for pasta to boil. Too much oregano for my taste, and no Basil?? Simple but very good. What more can I say? Delicious.